Imagine a rubbish truck full of discarded clothing going to the rubbish tip every second. This is how much waste is generated in the clothing and fashion industry globally  every day, with almost 60% of all clothing ends up in landfill or incinerators within a year of purchase . There has been significant growth in the clothing industry this century. 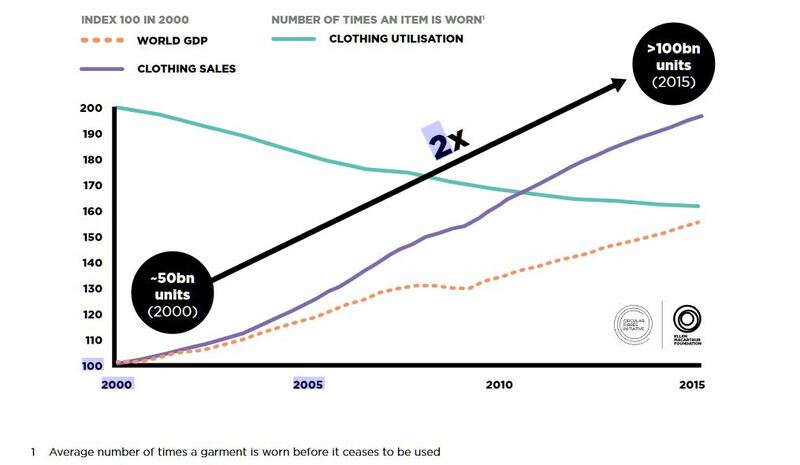 McKinsey and Company  estimate that between 2000 and 2014 the number of garments purchased by the average consumer increased by 60%, while the Ellen MacArthur Foundation has calculated that clothing production doubled in the first 15 years of the century . In the same time, the number of times a garment is worn has decreased by 36%  (see Figure 1). Fast fashion relies on cheaply produced and priced garments that capitalise on fashion trends by increasing the number of seasons from the traditional two (summer and winter) to as many as 52 micro seasons [7-9]. The low cost of fast fashion relies on poor quality of materials and production techniques are based on speed rather than longevity, which means that clothes are not designed to last long. The availability of cheap clothes means there is little incentive for customers to keep their clothes for a long time, and advertising and fashion industry encourage women to update their clothes on a regular basis. The fashion industry, particularly fast fashion, has a major impact on the environment. According to a study by Quantis , the clothing and footwear industry is responsible for just over 8% of global carbon equivalent emissions (p. 18), as well as a being a major contributor to a range of other environmental issues including the over use of water and other resources, and the impact on eco systems (e.g., acidification and toxicity to wildlife). It is one of the biggest polluting industries in the world . It is estimated that 60% of fast fashion produced in a year is sent to landfill or incinerators within 12 months of production  and less that 1% of the material is recycled into new clothing . In Australia, according to the Australian Bureau of Statistics , 88% of discarded leather and textiles ends up in landfill. The following video has more on fast fashion. Polyester and other synthetic fibres now dominate the clothing industry. But these fabrics are made from fossil fuels  and are a large contributor to climate change. For example almost 70 million barrels of oil are used each year to produce polyester for the clothing industry . While some clothing companies are using fabric made from recycle plastic bottles (which sounds like a great idea), there is still a significant environmental cost [10, 11]. Every time you wash a polyester garment, 1000s of tiny microfibers are released. While some of these microfibres are removed by wastewater treatment plants, many still find their way to our waterways and are a becoming an increasing part of the problem of plastics in our oceans and other water ways. For more on the impact of microfibres watch the following video by the producers of the Story of Stuff. As well as the environmental costs of fast fashion, there are also many social costs. On 24 April 2013, the working conditions for many textile workers was tragically brought to the World’s attention when 1134 people were killed in the collapse of a garment factory in the Rana Plaza, Bangladesh. While there have been improvements in the last five years, much more still needs to be done [12, 13]. The wages of many workers in developing countries making clothes for consumers in over-developed countries, mean that they live in poverty despite working fulltime. In 2016 the legal minimum wage was as little as 39 cents (AUD) an hour in Bangladesh, 62 cents in Indonesia and 64 cents in Vietnam (pp. 9–10). (There is an interesting post about the cost of living in Bangladesh on the Trusted Clothes blog.) With some CEOs of large clothing countries in Australia (like Just Jeans, Kmart and Target) earning over $4 million a year, it would take a worker on the minimum wage in Bangladesh over 4000 years to earn the annual salary of the CEO (p. 16). 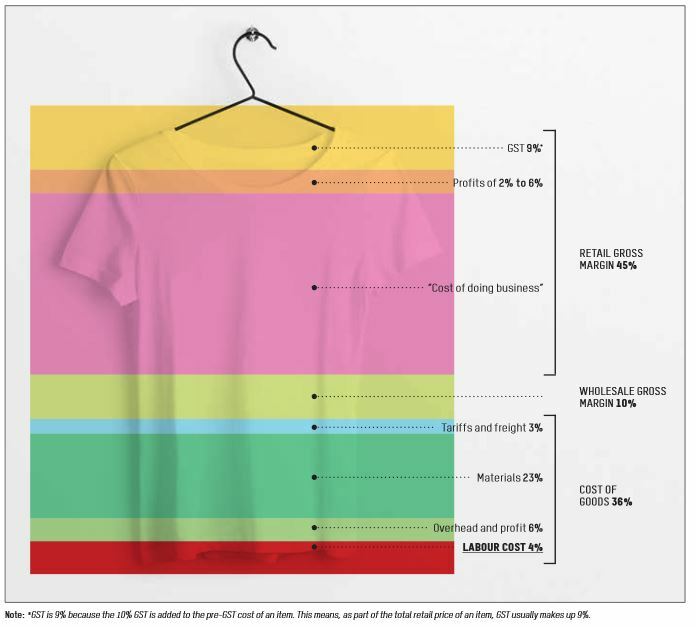 As shown in Figure 2, despite the vital role of the people who make the clothes, on average, only 4% of the cost of our clothing makes it into their hands. Figure 2: Average cost structure of Australian clothing prices (Source: Oxfam). Pressures arising from the short turnaround required for fast fashion means that workers (mainly women) in garment factories frequently face unsafe work condition, forced or child labour, and sexual and physical violence [14-16]. Recently there has been an increasing focus on the environmental and social costs of fast fashion but we still have a long way to go. In the next post I’ll outline some steps we can take to help make a difference. The widening gap between rich and poor – Time to even it up. Remy, N., Speelman, E., & Swartz , S. (2016). Style that’s sustainable: A new fast-fashion formula. McKinsey and Company. Chrobot, P., Faist, M., Gustavus, L., Martin, A., Stamm, A., Zah, R., & Zollinge, M. (2018). 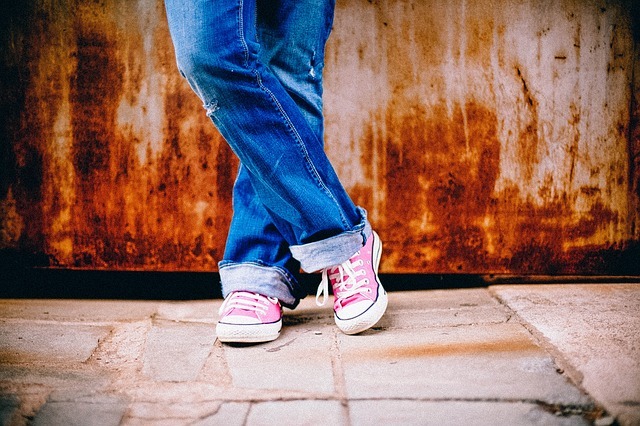 Measuring fashion: Environmental impact of the global apparel and footwear industries study. Full report and methodological considerations. Lausanne: Quantis. Conca, J. (2015). Making climate change fashionable – the garment industry takes on global warming. Forbes. Australian Bureau of Statistics. (2013). Information paper: Towards the Australian environmental-economic accounts (4655.0.55.002). Ellen MacArthur Foundation. (2017). A new textiles economy: Redesigning fashion’s future. Drew, D., & Yehounme, G. (2017). The apparel industry’s environmental impact in 6 graphics. World Resources Institute. The University of Queensland. (n.d.). Fast fashion quick to cause environmental havoc. Lohr, S. W. (2014, 19 October). 5 truths the fast fashion industry doesn’t want you to know. [Blog post.] Huffington Post Life. Taylor, T. (2018). Clothing and textile manufacturing’s environmental impact and how to shop more ethically. ABC Science. Safi, M., & Rushe, D. (2018). Rana Plaza, five years on: Safety of workers hangs in balance in Bangladesh. The Guardian. International Labour Organization. (2018). The Rana Plaza accident and its aftermath. Emran, S. N., & Kyriacou, J. (2017). What she makes: Power and poverty in the fashion industry. Carlton, Vic: Oxfam Australia. Hodal, K. (2018). Abuse is daily reality for female garment workers for Gap and H&M, says report. The Guardian. Bhattacharjee, S. S. (2016). Gender based violence in the H&M garment supply chain. International Labour Organization. This entry was posted in Environmental sustainability and tagged Consumption, Environmental sustainability, Fast fashion, Social change, Social justice, Sustainability. Bookmark the permalink.